As official shoe men’s footwear partner, Robinson’s Shoes is pleased to offer for private sale a rare and valuable limited edition print to mark Rory Best winning his 100th cap for Ireland, and leading the team to an historic “triple crown” of epic victories over all three southern hemisphere giants in 2016. 2016 was always set to be a special year in Irish rugby, with matches against all three southern hemisphere giants, including two against the mighty All Blacks - one in the historic setting of Soldier Field, Chicago – included in the fixture list. It was also to be the year in which - form and fitness permitting - Ulster legend Rory Best was destined to win his 100th cap, becoming the first Ulsterman and only the 5th Irishman to reach this remarkable milestone. With history beckoning, little did we know of what lay ahead, when Rory lead a fourteen man Ireland to a 26-20 victory over South Africa in front of 43,000 stunned fans at Newlands in June, the first ever Irish victory over the Springboks on South African soil. Whilst this victory stunned the rugby world, what was to happen next shook it to its very core. On 5 November 2016, on an emotion-charged occasion, Ireland took to the pitch at Soldier Field, Chicago to face the might of the legendary All Blacks. It was only a few short weeks after the tragic and untimely death of Munster and Ireland rugby legend, Anthony Foley, and Ireland lined up to face the Haka in a figure 8 formation as a tribute to the late “Axel”. In a match that will go down in history as one of the greatest games ever played by an Irish side, Ireland defeated the All Blacks 40-29 to achieve their first ever victory in 29 matches spanning an incredible 111 years. Having taken two southern hemisphere scalps, Ireland were set to face Australia with the prospect of a “triple crown” looming large. On 26 November, Ireland took on Australia in front of a packed Aviva stadium, in a match in which fate would have Ulster legend Rory Best winning his 100th cap for his country. Having entered the arena alone to take the applause of the crowd on this special occasion, Rory lined up for the anthems with his eldest kids proudly by his side. What followed in a highly-charged Aviva stadium was a hard fought 27-24 victory over the Wallabies, meaning that Ulsterman Rory Best had led Ireland to their first ever series of victories over all three southern hemisphere giants in the one year - perhaps Ireland’s greatest ever rugby achievement. 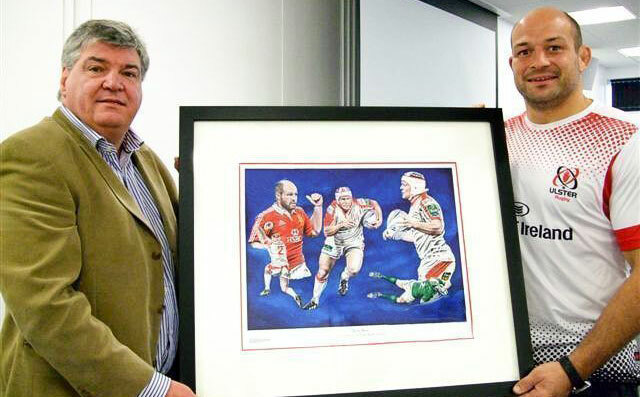 Hanna Fine Art is delighted to mark Rory’s magnificent achievements with the release of a special limited edition print featuring Rory in action for Ulster, Ireland and the British & Irish Lions. Published in a limited edition of only 95 prints, each print has been personally hand-signed by Rory to create an historic and highly collectable piece of Irish rugby memorabilia, which will be sold raise funds for the Ulster Rugby Academy. The print has already raised over £2,200 for the academy and is now being offered at the special price of £195 (published price £295) to mark this special occasion. The price includes photographs of Rory signing the print as proof of authenticity.